Join us every month for a new Create + Sip experience! Our afternoons of wine and fun offer more than just painting. Each event is taught by one of Workhouse's talented studio artists, so we play with lots of techniques. You'll have a great time creating (and sipping), resulting in a unique piece of art made by you. 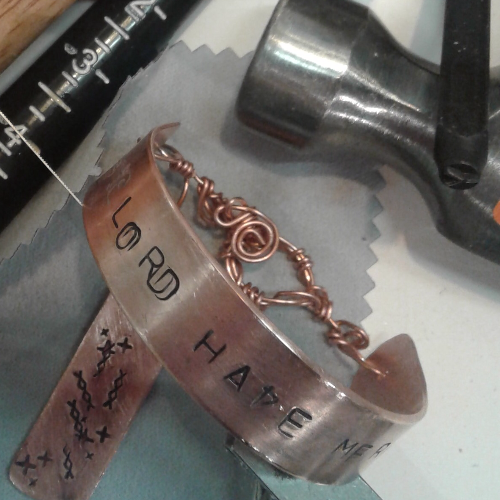 Make a stamped metal bracelet for you or someone you love! Workhouse artist Nadine Thola will show you how to create a personalized bracelet, or how to cut up the bracelet blank to make rings, earrings or pendants. Nadine will demonstrate how to use hammers, punches, and other texturing devices to stamp the metal with your name, mandala patterns, or your own design. You also can wrap wire around or through your bracelet to add design and depth, or learn how to use ink to color it. You'll take home a unique piece of jewelry (or two) that you can wear everywhere this summer.